Are you needing to translate your WordPress contact forms into another language? WPForms simplifies this process as much as possible so that you can translate your contact forms and reach a global audience to keep your conversion rates high. In this article, we’ll show you how to translate your WordPress contact forms. Why Translate Your WordPress Contact Forms? Translating your WordPress contact forms is a good idea if you’re looking to reach an international audience. After all, only 25% of the internet population speaks English. But 53.1% of the content across the web is available in only English. If your site is in English only, this means you may potentially be alienating a large portion of the internet population that speaks a different native language. So, now that you see why catering to other native languages is important, let’s see how to translate your WordPress contact forms. Next, you’ll need to create a form. For help with this step, see our tutorial on how to create a simple contact form as an example to get started. 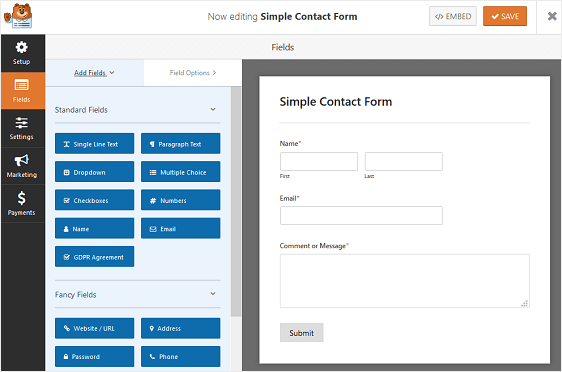 You can add additional fields to your contact form by dragging them from the left hand panel to the right hand panel. Then, click on the field to make any changes. You can also click on a form field and drag it to rearrange the order on your form. 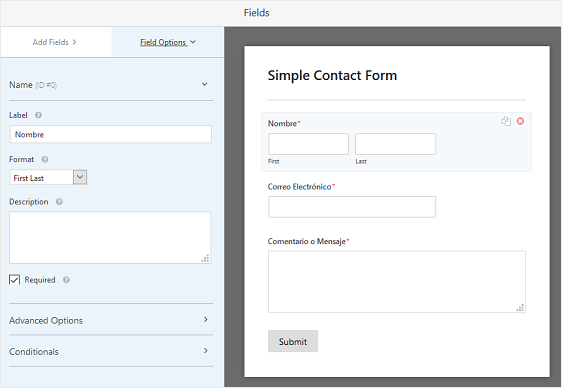 Translating your contact form’s fields is really easy to do in WPForms. By default, all of your forms will be in English. To change the labels for any form field, all you have to do is click on the form field in the form editor and replace the default label with the language you want to translate your form into. This requires that you either know the language your translating your contact forms into, or have access to a translator. Not sure if these online tools are accurate enough? Well, according to the Washington Post, Google Translate is nearly as accurate as human translators. That means when it comes to simple form field translations, you’ll be okay using it or something similar. Validation messages are messages that appear when a required form field is left empty or someone inputs incorrect data into a form field. 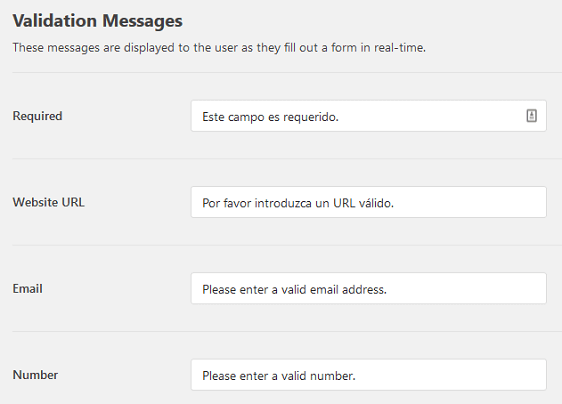 To translate your contact form’s validation messages, go to WPForms » Settings and click on the Validation tab. From there, all you need to do is change the current validation messages, that are by default in English, to the language you’re translating your contact forms into. Again, this can be done personally, using an online translation tool, or even a professional translator if need be. Your validation messages will now translate on your contact form. And there you have it! You now know how to translate your WordPress contact forms. If you want to translate other WPForms pages that can be seen from the WordPress dashboard, be sure to check out this helpful tutorial on how to translate WPForms admin ages, form builder, and default values. If you’re looking for even more ways to boost your form conversion rates, check out this roundup of ways to fix your low converting contact forms. We have three identical application forms to our university programs on one site, and I see how we can create three identical forms in different languages – BUT how can we setup three different Validation messages in each language, one set for each form?